I’m back with another fun project for the Cricut Design Space Star Challenge. This month we were challenged to come up with Christmas gifts, and while I agree that it feels a little too early to start thinking about Christmas gifts I think you’ll love this quick, easy and inexpensive gift idea. These DIY Christmas Wine Bottle Gift Tags are perfect for all of the holiday parties and entertaining you’ll be doing in a few months. With my new Cricut Explore and Design Space this project came together in less than 20 minutes and cost less than $15. So if you are looking for a thoughtful hostess gift, or a quick gift for friends and neighbors this is it. I made two different versions, I know I’m partial but I love them both! I started by uploading my wine bottle tag SVG file. I added the Eat, Drink and be Merry text and positioned where I wanted it on the tag. Then the machine write, cuts and scores the tag all with the push of one button. Next, I cut out the embellishments I wanted for my tag. I found a 3D Christmas tree in the Design Space library and knew it would be perfect for my simple tag. I glued the embellishments on and slipped the tag over my bottle of Sparkling Grape Juice. I used the same Christmas tree as a stencil and made a set of DIY Christmas Coasters to go with it. The perfect, quick little Christmas gift. I found this fabulous gold glitter paper at Michaels and I knew I needed it to create a sparkly Christmas Gift Tag with it. Since the paper was so fancy I thought the tag should be fancy too. I decided to cut out the “Making Spirits Bright” in black vinyl rather than using the pen to write directly on the paper and I really like the bold look. I cut out some holly berries, added some red glitter and now this gift truly shines! 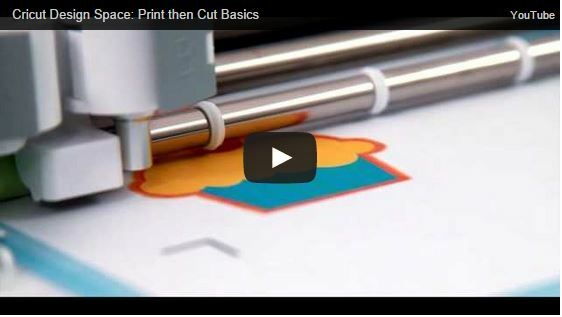 Have you heard about the NEW Cricut Design Space Print then Cut technology? If you can print it then you can cut it with the Cricut Explore, how cool is that!?! Go here for more information about this new feature. And, if you love crafting, have a website and would like to join Cricut’s Affiliate program, you can sign up here. Have you started working on Christmas projects yet? What handmade gifts will you be giving this year? Nice. I like the idea of creating personalized wine tags. I think you can also make DIY gift wrap tags using that small machine. This makes sending gifts more special to your loved ones and colleagues this coming holiday season. I just found your blog and love basically all of your projects! I also just got my Cricut Explore for Christmas from my hubby (after years of asking)! He wants me to make wine tags for his homemade wine and I was wondering if you’d share your wine tag SVG? (I also tried to click on another tag for your homemade lemon scrub and it wouldn’t download!) Merry Christmas and crafting!!! Hi! Yay for getting a new Cricut Explore, you are going to LOVE it! I would be happy to share the file, as long as I saved it 🙂 I will email it to you. Thanks for stopping by Giggles Galore! Any chance you could email me the wine bottle tag file as well. I can’t seem to find one. I am loving your projects! Hi Karen, send us an email at mariah(at)gigglesgalore(dot)net and we can help you out. Thanks! I’m curious, did you make the wine tag template yourself or are those from cricut? I can’t find any bottle/wine templates/tags in cricut design space, are you able to email it still? Will you please send me the link? I cannot find it cricut design space. Hi Shelly, please email mariah(at)gigglesgalore(dot)net and we will help you out. May I suggest putting this file in your Freebies section? It’s fabulous and I’m sure I’m not going to be the last person to request an email as well. Fabulous job!! Great idea Jennifer, I will update that. Enjoy! I’d also love a copy of the file, it’s awesome! Hi Tasha, please email me at mariah(at)gigglesgalore(dot)net if you still need help accessing this file. Thanks! Hi! I love your bottle tags and would love a copy of the file when you get a chance! Thank you! Hi Kim, please email us at mariah(at)gigglesgalore(dot)net and we can help you out. I was wondering if you could share the svg file for wine bottle tags. Love you site. Hi Connie, email mariah(at)gigglesgalore(dot)net and I can send you the files. Thanks for stopping by! Hi Yvette, I sent you an email with the details and information. Let me know if you have additional questions or need help. Hi, love your wine bottle tags! I’m new to the cricut world, would you be interested in sharing your svg thanks! I sent you an email with the information you need. I love the wine bottle tag. We’re doing a wine-themed booth at a RFL boutique. This would be perfect. Could you send me the file please or direct me to it. I’ve also been on there hunt for one for a few days…there is nothing in Design Space! Hi Jodi, I’ve emailed you with the design files.